Generations of UFO enthusiasts believe the event 66 years ago involved an alien landing outside the New Mexico town? Google's latest doodle celebrates the 66th anniversary of the so-called Roswell incident - which generations of UFO enthusiasts and others believe involved an alien landing outside the New Mexico town. Conspiracy theorists have claimed that US military had captured a crashed alien aircraft outside Roswell in July 1947, but authorities insisted that the incident merely involved the recovery of debris from a top secret surveillance balloon. Much suspicion about the incident was originally ignited by a press release issued by a local US military base, which mentioned that the crash involved a flying disk. Seeking to put conspiracies to rest in June 1997, the US Air Force released a 231-page report titled "Case Closed: Final Report on the Roswell Crash". It asserted that alien bodies witnesses reported seeing at the crash scene were actually life-sized anthropomorphic test dummies. However, interest in the incident was stoked once again in 1995, when a London-based entrepreneur called Ray Santilli claimed that he possessed film footage showing an autopsy being peformed on one of the Roswell aliens. Santilli said in 2006 that the film was a reconstruction of what he insisted was real events. The Google doodle errs on the side of humour, allowing users to control a small animated alien figure as it goes about a series of tasks on a Roswell-like landscape. 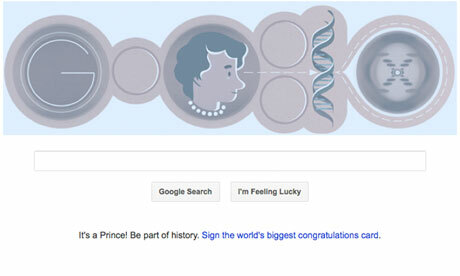 The latest Google doodle celebrates the life and work of British biophysicist and x-ray crystallographer Rosalind Franklin, whose research led to the discovery of the structure of DNA. Franklin was born in Notting Hill, London on 25 July 1920. 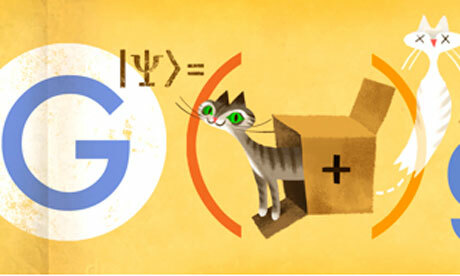 The second "o" in the doodle contains her image, while the "l" has been replaced with the DNA double helix. Franklin also made critical contributions to our understanding of the molecular structures of RNA, viruses, coal and graphite. She died from ovarian cancer in April 1958, aged just 37. The scientist has perhaps become best known as "the woman who was not awarded the Nobel prize for the co-discovery of the structure of DNA". During her DNA research, Franklin worked at King's College London under Maurice Wilkins. The story goes that he took some of her x-ray crystallography images without her knowledge and showed them to his friends, Francis Crick and James Watson, who were also trying to discover the structure of DNA. Wilkins, Crick and Watson were awarded the Nobel prize in Chemistry in 1962. Crick later acknowledged that Franklin's images were "the data we actually used" to formulate their 1953 hypothesis regarding the structure of DNA. The most significant of those images is known as Photo 51, which is also the inspiration for an exhibition currently at Somerset House in London. Google is 15 years on 27 September 2013. To celebrate, here are 15 facts you probably didn't know about them. 1. Google was originally called BackRub. The homepage read: "BackRub is a 'web crawler' which is designed to traverse the web." 5. Ayers went on to become the firm's executive chef, overseeing a team of 150 employees across 10 cafes at its headquarters in Mountain View, California. 7. Around 1,000 of Google's employees became millionaires when the company went public in 2004. 9. The "I'm Feeling Lucky" button, which bypasses the results page to take users directly to the first result of their search, has been estimated to cost Google around $100m in lost ad revenue every year. 11. Google's first official tweet was the words "I'm feeling lucky" in binary. 12. Almost all of rival company Mozilla's money comes from Google. The firm pays $300m a year to be the default search engine on Mozilla's web browser Firefox. 15. A new Google employee is known as a "Noogler" and a former employee is referred to as a "Xoogler"
You know, you're right, I didn't know those things. I should have BackRubbed it. This recent doodle was to represent the first parachute jump. ... this time in honor of the 216th anniversary of the first parachute jump. The 3,200-foot jump was carried out by André-Jacques Garnerin on Oct. 22, 1797 at Parc Monceau in Paris. Google celebrates the 50th anniversary of Doctor Who. I thoroughly enjoyed the Dr Who celebration game! 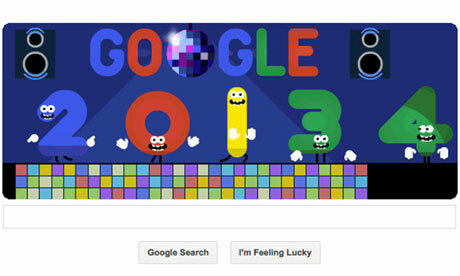 Google has marked the countdown to 2014 with a disco-themed Google Doodle on New Year's Eve. The animation shows the digits making up 2013 doing a halting jig on a stage under a glitter ball while the number 4 waits to take its place in the line-up. 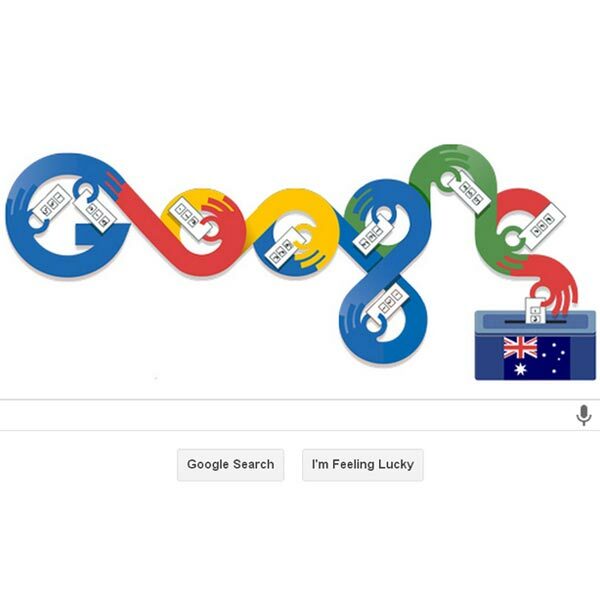 Clicking on the Doodle takes the user through to a page of results listing New Year's Eve festivities, news articles and other results from around the world. A further link on the search homepage goes to Google's Zeitgest 2013 interactive, giving highlights of the year in video, the top 100 searches, search trends, a 2013 gallery and a page of year-in-review lists ranging from celebrities to song lists, recipes, sports teams and TV shows.